But why November, and why on a Tuesday? As a State Department explainer from 2008 put it, back then the U.S. was a predominantly agrarian society. November made sense because it was after farmers were done with their harvest, but before hard winter weather that could make it difficult for them to get to town to vote. And since traveling by horse over unimproved roads could take a while, lawmakers wanted to avoid making their constituents travel to or from the polls on a Sunday (widely considered a day of rest and worship, not politicking). In the 21st century, however, America’s election schedule makes it an outlier among advanced industrial democracies. 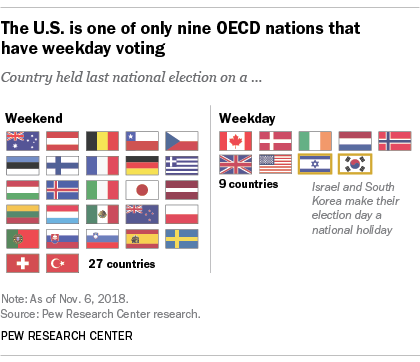 A Pew Research Center analysis finds that 27 of the 36 member countries of the Organization for Economic Cooperation and Development hold their national elections on the weekend, while two others (Israel and South Korea) hold elections on weekdays but make those days national holidays so economic hardship won’t be a barrier to electoral participation. There have been repeated proposals in the U.S. over the years to either move Election Day to the weekend or make it a federal holiday, on the grounds that doing so would boost turnout. 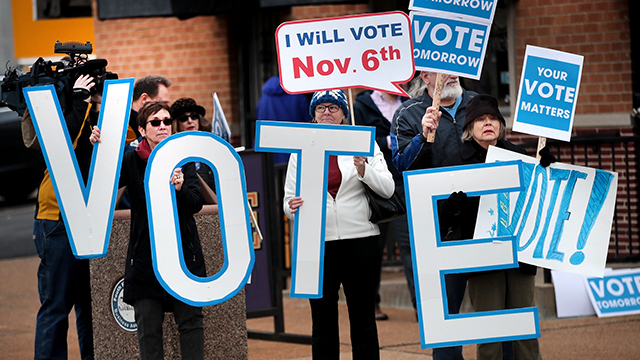 A recent Pew Research Center poll found bipartisan majority support for the idea: 71% of Democrats and Democratic-leaning independents and 59% of Republicans and GOP leaners said they would support making Election Day a national holiday. But while proposals to do that have periodically been introduced in Congress, none have gotten very far. 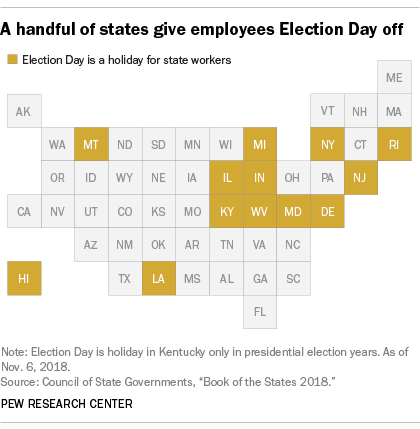 Election Day is, however, a paid holiday in 13 states, at least for state employees (though Kentucky state workers only get the day off in presidential-election years); in New Mexico, state workers are allowed two hours of paid administrative leave to vote. Many states require employers to give their workers time off to vote; in some states, such as New York and California, workers can’t be docked any pay for taking time off to vote. And many employers, from outdoor clothing company Patagonia to restaurant chain Cava, have taken it upon themselves to give their workers paid time off to vote this year.